I’m Sukhwinder Singh Gill and I was born and raised in the Lower Mainland. Fortunately I grew up reading, writing and speaking Punjabi. Though my Punjabi was limited to reading and understanding Gurbani for many years, I was still able to speak it fluently. After starting university I decided to take a Punjabi course as an elective. I did not envision myself pursing a degree so heavily based around Punjab but after taking a couple of Punjabi courses, I knew that this is where my passion laid. In the last year of my undergraduate degree I took Punjabi 401 (Devotional Literature in Punjabi) with Dr. Anne Murphy and It was and still is the most impactful course I have taken. I never did truly understand the English translations I would often read at the Gurdwara sahib- they were an afterthought. However, after having taken this course with Dr. Murphy, I was exposed a whole different way of understanding Gurbani and it was a beautiful realization because it enriched my experience. Punjabi Studies at UBC is one of the if not the best Punjabi program in North America. The program is important because it allows for students to delve deeper into the Punjabi language and literature. If a student is on the fence about taking, Punjabi, Asian Studies or Punjabi-related courses I would highly encourage them to take them because of the impact they can have on one’s life. I began to see Punjabi as something much more than a language that was only spoken at home. I am hoping to complete my Ph.D after my Masters in Asian Studies and the Punjabi Studies program is helping me achieve this goal by giving me the necessary tools to work through my thesis. I am researching Bhai Gurdas Dia Varran. The project is a response to a book that was published recently about the Varran and what they mean to the Sikh Panth. Moreover, the project also looks at how the Varran have been received in the panth. It is important to explore this topic because they lays close to the hearts of the Sikhs and because the Varran have been called the key to the treasure chest (The main scripture of the Sikhs, Sri Guru Granth Sahib Ji). If this title holds true, then the Varran serve a far greater purpose than simply being poetry. 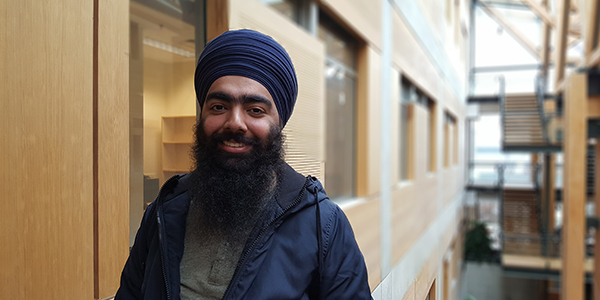 I chose the Punjabi Studies program at UBC because it is close to home and is one of the best programs in North America.